I know I am terribly late in sharing about this column I am doing for Exotica magazine. Seeing my interest in unusual ingredients, exploring new recipes with them and also my column at Down to Earth, I was asked by Exotica to do an ingredient based recipe each month for the magazine. The ingredients that we are growing in the country are great quality most of the times but don't get their due respect as most of us are unaware about them. The biggest shock of my life regarding this lack of awareness about ingredients was when I heard a very senior cardiologist say that flax seeds are imported and not grown in India. This was about 6 years ago and I decided something should be done to correct such a lack of awareness, a lot of us are actually forgetting what our older generations used to grow and eat. Not only about the traditional and native ingredients, there are many fruits and herbs that were 'introduced' by the settlers all across India and made it's own, so much so that we don't even realise the potatoes, the chillies and even the mango was not native to India once. India being so varied in the terrains all across the country, anyway has a very rich flora and fauna, type of food cultivation and food habits so there is always something new to explore in the far away corners of the country. I am hoping to explore some such native and 'introduced' ingredients and foods through this column of mine at Exotica. Suggestions from you are also welcome, I learn every day interacting with all of you too. 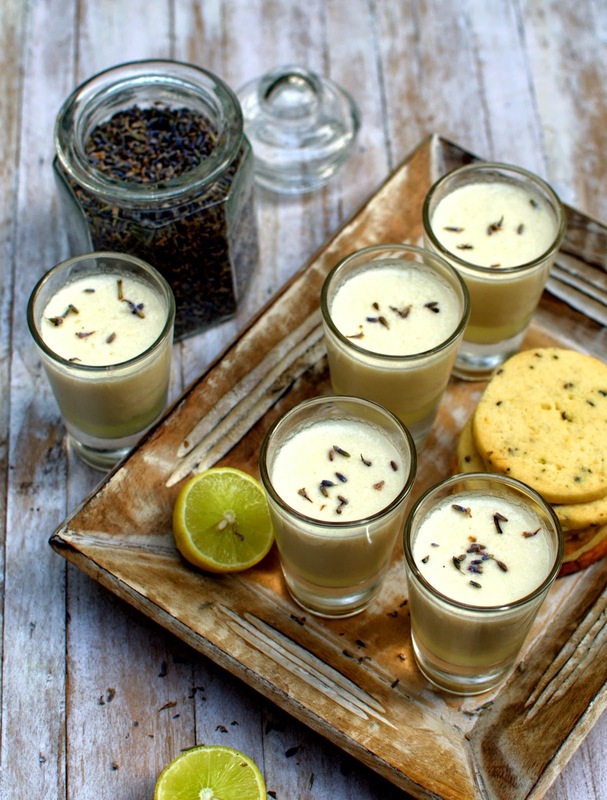 The first ingredient to be highlighted was Lavender, a bright violet that we had once seen growing in Palampur and had experimented with the aromatic flowers a few times, I was developing a Lime and lavender butter cookie recipe for Mittal Teas back then and decided to pair those cookies with a nice refreshing posset. Read my piece (verbatim) that was published in March issue of Exotica. A mention of lavender brings thoughts of calmness as it is known for inducing sleep and relaxing the nerves. As if Lavender has borrowed it’s colour from Mother Nature to carry on the same vibe through visual senses too. The violet-purple haze of Lavender fields looks heavenly, like connecting the dots with all its beauty of visual, aromatic and flavour profile, the gift of God to soothe the nerves and bring tranquility to the face of Earth. Adding lime to the mild aromatic flavours of lavender makes the lavender energy zingier, ready to seduce anyone who takes a whiff. Enjoying a dessert made with these flavours would be a perfect foil to wrap a meal with loved ones. Lavender grows in Himachal Pradesh and is available fairly easily in India now. Many farmers are growing exotic flowers in the foothills of Himalayas to cater to domestic demand and Lavender is grown mostly for essential oils to be used in perfumery and aromatherapy. Recently I was talking to Mr. Vikram Mittal from Mittal Teas who uses Himachal grown Lavender for his tea blends and got to know this locally grown Lavender is as fragrant as imported blossoms. He gave me a fragrant sachet of Lavender to experiment with and I infused these beautiful aromatic blossoms in my tea that day quite predictably. Then I started thinking about some nibbles to be enjoyed with tea and promptly did a trial batch of Lime and Lavender cookies and the resultant flavours seduced everyone who tasted. Later the same flavour bouquet was used in a simpler easy to cook posset with the same flavours to be served with the cookies. 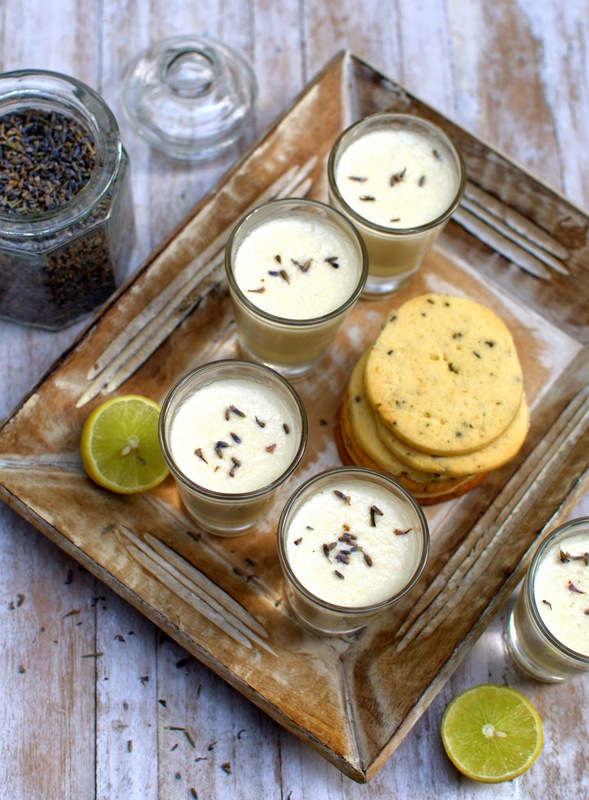 The Lime and Lavender cookies will be available very soon at all Mittal Tea outlets, the posset can be made within 10 minutes at home for a quick but delectable dessert. Posset is a traditional British drink that was made by mixing hot milk with herbs and ale to curdle it and was served warm. 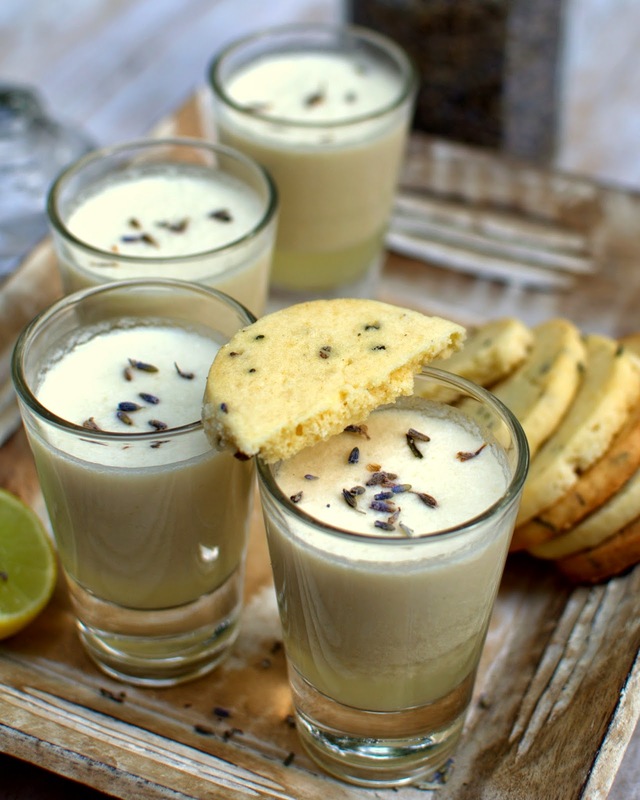 Posset used to be a homemade potion for common colds and to induce good sleep in older days, lavender does absolute justice to that traditional way of having posset before bedtime. Interestingly, Lady Macbeth used poisoned posset to knock out the guards outside the Duncan’s quarters in William Shakespeare’s Macbeth. It must have been a much desired drink to be used like this. Later the posset became popular as an easy yet fancy set dessert to be served warm or chilled. This balmy lime and lavender set posset would definitely induce good sleep and would bring tranquility after a long day. Simmer the cream along with lavender, lime zest curls and sugar for about 6-7 minutes. Strain it and mix with the lime juice when it is still warm. If you want a creamier posset you can mix the cream with lime juice when completely cold, pour in serving glasses and refrigerate till set. Adding the lime juice to cream mix while the cream is still warm results in a slightly grainy posset with a little bit of syrup in the bottom. Serve with plain vanilla butter cookies or lime and lavender cookies to reinforce the flavours in this minimalist dessert. 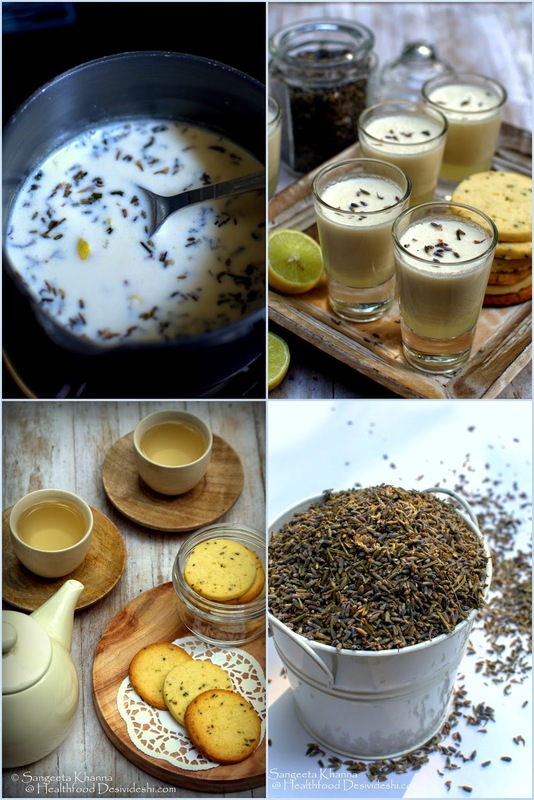 This posset is so easy to make you might like to combine rose or other aromatic flowers or herbs to make this, if lavender is not your favourite or not available to you. April issue of Exotica is out too, will share the next story soon with all of you. Stay tuned please.